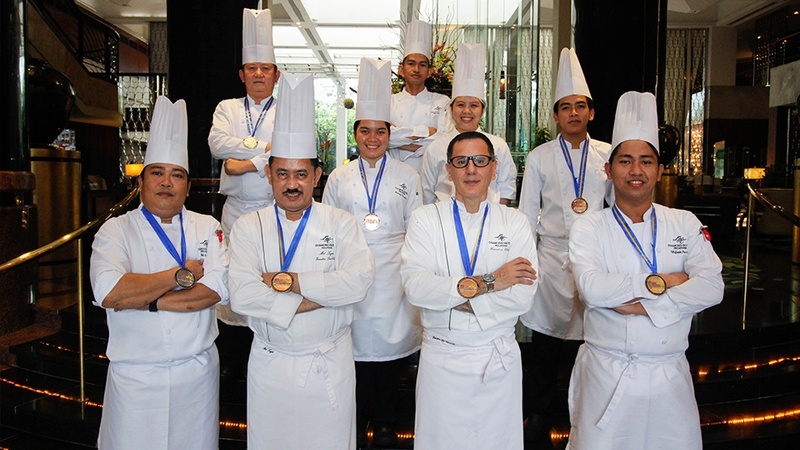 Diamond Hotel Philippines' culinary team has proven again their expertise and prowess in the kitchen as they bagged two Silver medals and four Bronze medals at the prestigious Philippine Culinary Cup 2016. This year's competition has paved way for greater recognition of the Filipino chefs in the culinary field. In line with its 7th year celebration, the new standard has created an enhanced platform in culinary excellence, making this event a big success. In an interview with Diamond Hotel's Executive Chef, Chef Salvatore De Vincentis emphasized that the key ingredient for a winning taste is not only the chef's outstanding skill, but also his or her passion for perfection of his or her craft. Diamond Hotel’s culinary competition champions and their respective categories are: Chef Willson Tumanon, Silver for US Pork and Bronze for Local Fish and Seafood; Dream Team Challenge Silver Medalists Chef Mel Taylo, Chef Deo De Guzman, Chef Vhil Pascual and Chef Rod Nuñez; Chef Haney Ecraela ,Bronze for Quick Fire; Chef Mon Quilon, Bronze for US Beef; and Chef Dexter Sanchez, Bronze for Divella Pasta. The hotel takes pride in its associates and is devoted in providing full support to maximize potentials and leverage to global standards.